Amaze your dear ones in all cities in India with an all red teddy. The teddy has a pair of bulging eyes with an apprehensive expression. The cuteness of the teddy is sure to allure your dear recipient. The teddy holds a love heart cushion in its hand to make it look even more alluring. 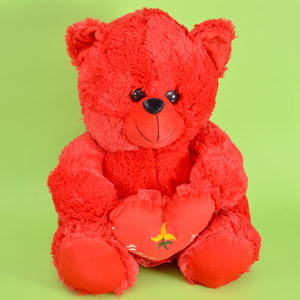 Thus send this teddy along with other Gifts across India through GiftsAcrossIndia.com to be delivered in a safe mode.